Samsung confirmed to The INQUIRER that they have started offering Android 4.0 Ice Cream Sandwich updates to owners of the Galaxy Note in the UK. 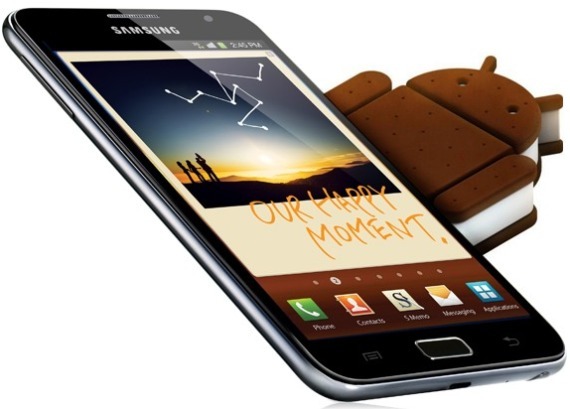 Samsung confirmed to The INQUIRER that they have started offering Android 4.0 Ice Cream Sandwich updates to owners of the Galaxy Note in the UK. But the update can only be availed for a SIM free or an unlocked Galaxy Note, while those owning a network locked Note will have to wait for their respective carrier's approval. "Samsung UK can confirm that the Android 4.0 Ice Cream Sandwich update for Galaxy Note has been released and will be available when approved across the networks." Reps from The INQUIRER are said to be staying in touch with mobile networks for any update timings. The INQUIRER also claims that the Android 4.0 ICS update will offer a number of upgrades to the 5.3 inch Galaxy Note. While there’s the reworked user interface along-with an added Face Unlock Feature, the Note will also be upgraded with a bundle of premium content, including an e-card making app called S Story, an advanced note-taking app called S Note, PDF annotation and the exclusive Angry Birds Space content. Sources have claimed that with the new interface, users are certain to feel like owning a brand new Galaxy Note all over again. The update is about 320MB and is available through Samsung's PC software suite Kies. The phone/tablet Galaxy Note, famously termed "the phablet", has seen increasing success since its debut. Samsung had said in an earlier announcement that as of March, the global shipments for the Note had surpassed 5 million units and by May the Note had sold 2 million units in South Korea alone. And with the latest upgrades, the Note is sure to maintain its popularity throughout the masses.